Creative projects to soothe the soul! Back on Wednesday, February 3rd, 2016 I posted this Is is Yarn or Fabric? I decided that I was going to make a bedspread just like the one featured in the post. After all, I have a full size bed not a king size bed, so I won't need 270 granny squares and I'll be finished in no time. Right?! 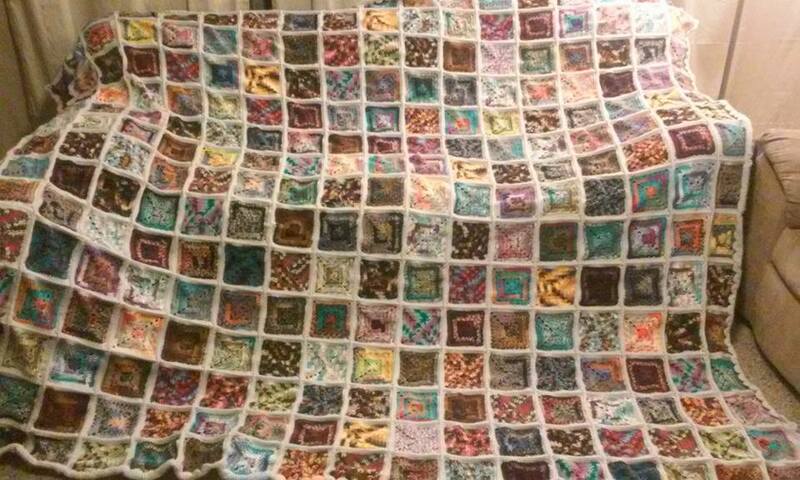 This photo above shows 150 granny squares, 25 different colors of yarn plus the white edging. I need 48 more granny squares, 8 more colors to finish the granny square portion of this project. Then I'll have to put it together. Wish me luck. . . .I've gone to far to turn back now. I'm committed. The crocheting continues . . . I used a pre-stretched aida canvas:6" x 6" (a first) and using a photo from a Hobby Lobby brochure I stitched this beauty up. It took a lot longer than I thought it would. But finally, it is finished. Hobby Lobby featured this on a brochure but there was no pattern online or in the brochure. The ad stated that this was a perfect beginner piece. That's not quite true. First of all there was no pattern, and second of all the photo showed the project stitched and then stretched onto the wooden frame. There is no possible way that someone could stitch it to match the photo without stitching it first and then stretching it. Clearly this was not a beginner project. 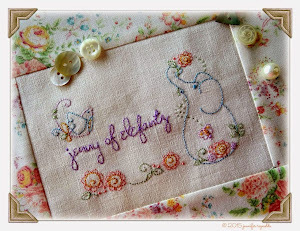 In fact I could see a beginner becoming so frustrated with this project that they gave up stitching forever. I really wish that Hobby Lobby would stop doing this type of thing with their brochures. That being said, I like the way it turned out, even if I had to make adjustments in the design. I don't know how much of a fan I am of pre-stretched aida cloth. But it is a unique piece and I have it hanging on my wall. I took a bit of a break from the granny square bedspread that I'm working on. It was nice to create something other then granny squares for a change. Is It Yarn or Fabric? I saw this lovely king sized afghan on the internet the other day and did a double take. It was on Crochet Addict, and it looked like fabric. Was it fabric bordered by crochet, or was it all crochet? And if it was all crochet, what in the world did the artist do to get it to look like that? I'm intrigued. This beauty was created by Kristin Colyar. Come to find out, all the "fabric" squares are blended yarns. The granny squares are 6" square (the pattern for the granny squares is here: Craft Passion). 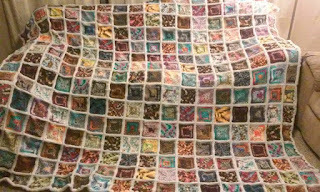 The afghan is 18 squares wide and 15 squares long, and features 40 different blended yarns. There are 270 squares total and I figured up that this was roughly a 6 squares repeat (so 6 squares per skein). Kristin used I Love This Yarn from Hobby Lobby. I've never used this yarn, so I thought this might be a good time to check out the colors available. It looked great in Kristin's king sized afghan. Well, I was a bit disappointed. I found the yarn, I counted the blended yarn colors and there were a lot more than 40, but a lot of the color combinations were not to my liking. I found one that was OK and I bought it. I'm going to make up some sample squares and see how it looks. The colors look great in her afghan, so maybe once the yarn is made into granny squares I'll like it better. The yarn is really soft and thinner than Red Heart yarn. But I don't know if I can get past the blended colors. I'd use Red Heart, I dearly love their color combinations, but I don't think that they have 40 colors of blended prints. I tried to look up color charts for both I Love This Yarn and Red Heart yarn on the internet and couldn't find a good chart for the yarn colors. I'll keep you posted on what I find out once I complete my experimental squares. On The Internet . . . I saw this pattern on a dubious website, (that I'm not going to recommend the website), but I am going to recommend the blog that it originated from: Simply Crochet & other crafts. I immediately fell in love with it and knew I had to make one. I had a difficult time finding the print yarn. I think it must be a Red Heart yarn that has been discontinued. Joann Fabrics in Salina had it and I bought all they had, which was 5 skeins, so I'm hopeful that this will be enough to finish this project. I'm using aspen print, buff, and frosty green. They look dynamite together and these colors make it very country looking. Originally when I saw this pattern I thought that the aspen print was fabric because it looked more like fabric than yarn. As I've worked on this at work, one of my co-workers became intrigued and began asking a lot of questions. Finally she asked me if I would show her how to crochet and I said that I would. We had an out of town work meeting to go to one day with a long drive ahead of us and she and I were sitting in the back. She said she would bring yarn and a hook but I didn't believe her. People say things all the time. But she showed up with hook and yarn and I showed her how to make a chain and a single crochet. By the time we got to the meeting she was "hooked" LOL. She wanted to take her crochet into the meeting, We talked her out of it. At lunch she wanted to go through the drive thorough because it would take time away from crocheting to go in to eat. We made her go in with us. Back at the meeting we had to wrestle her crochet away from her because she didn't want to get out of the car to go back to the meeting. On the way home, we stopped for gas and a potty break and she refused to get out of the car. LOL When we got home she said she was sending her daughters out to eat because it would take to much time to fix supper. I think I created a monster!!! Whatever you do in life, it has a ripple effect that you have no idea how many people it will touch. I started this project originally back in February 2015 and I completed the center of it. I was going through a stressful time and my stitches were all over the place. It was a wreck! In December 2015, I started getting interested in crochet again, due in a large part to The Crochet Crowd. I picked it back up, ripped out all my stitches and took it down to the yarn and started over again. And here it is today . . . I have the black skein to finish, then I'm adding on another 5 rows of the neon print, and finish it off with a row of black edging. I'm pretty pleased with how it's turned out. the crochet-a-long 2016 link for the dates that the patterns will be released. Also, sign up for the automatic updates, I did that and it is a great way to stay on top of the CAL. The CAL just started on January 13th and the next pattern release will be today, January 27th. I'm using neon colors for my Groovyghan and I'll post updates as I complete each step. © Lydia Lowe 2017. Ethereal theme. Powered by Blogger.